Albion Motorcars is also present on Facebook. Click here to join our page and stay up to date of our latest stock additions. 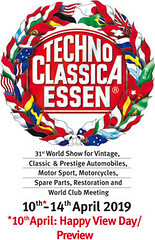 We invite you to visit us during Techno Classica in Essen. For the fourth time, Albion Motorcars will be present on the most important classic car show in the world. With great pleasure, we will be present at the 2019 edition of Techno Classica in Essen, from Wednesday 10/04/2019 until Sunday 14/04/2019. Our stand with nr. 5.0-406 is located in Hall 5, which is the main hall of the show. We will have a nice selection of exceptional cars on our stand like the very realistically priced Aston Martin DB4 Series III, one of the best Mercedes 300 SEL 6.3 and the iconic Renault 20 Turbo 4x4 Paris-Dakar - Ex frères Marreau. Looking forward to see you all in Essen ! Please visit our stand at this great show in Amsterdam. This year will be our first time at Capital Cars & Classics in Amsterdam, a great classic car event on Saturday 16/03 and Sunday 17/03. We will have three beautiful and exclusive cars on our stand shared with Classics2Drive, and we are looking forward to meet you there. More information about Capital Cars & Classics on the link below. 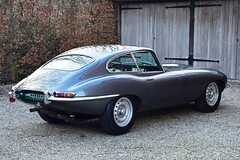 Another fantastic Jaguar E-Type FHC is just added to our inventory. 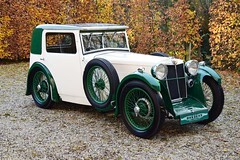 This example is a desirable 3,8 Litre, completely and professionally restored in 2004, and still in beautiful condition. The car is equipped with a 5-speed gearbox and still has the matching nrs engine block. The icing on the cake are the magnificent Dunlop alloys, which work perfectly with the gunmetal bodywork. One of the nicest examples we have seen so far. 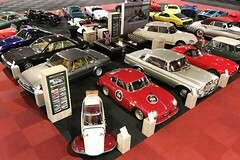 We invite you to visit our stand at Interclassics Maastricht 2019. The first classic car meeting in the new year. A very nice selection of exquisite classic cars will be presented on our stand. 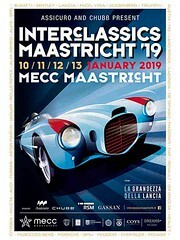 With great pleasure we invite you on our stand at Interclassics Maastricht from the 10th until the 13th of January 2019. 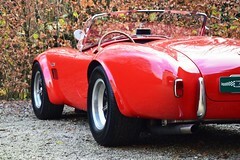 We will show some selected classic cars from our inventory, including the unique Costin-Nathan Astra RNR-2 (ex-Roger Nathan), a very competitive Shelby Daytona Coupé FIA historic racecar and the ultimate gentleman race car : Maserati 3500 GT FIA. Also some gorgeous roadcars will be present : a completely restored Citroën DS21 Pallas in better-than-new condition, a glamourous Aston Martin DB4 Series III and the dropdead gorgeous AC Cobra 427. 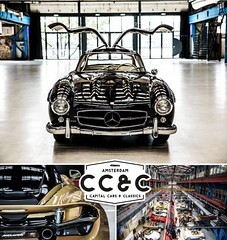 Please visit our shared stand with Classics2Drive (Z.1034 - Zuidhal) to discover these unique classic cars. Maserati 3500 GT FIA historic race car. Unusual and impressive historic race car, succesfully campaigned since 1983 and a welcome change on any starting grid in the world. 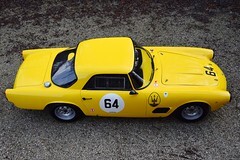 This Maserati 3500 GT has a brand new FIA HTP valid until 2028 and is eligible for many prestigious racing events. And it sounds as good as it looks ! Not a car for shrinking violets, but the perfect machine for the gentleman who wants to be just that little bit different. Mini 60 Years. Which Mini Mk1 would you like ? 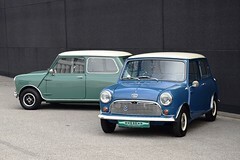 We have some beautiful classic Mini's available. The choice is yours. The legendary classic Mini will be 60 years next year. Many events are planned to celebrate this iconic car, and we have some great examples of the Mini Mk1 available to participate : a well prepared Cooper S road car and a rare Super De Luxe version with matching nrs and colours.Your chance to obtain one of the nicest classic Mini's on the market today. Prewar cars are special, and finding one of which only a handful are still in existence is even more special. The MG F-type Magna with Salonette bodywork by Carbodies was built in a very limited number of only 390 examples, and less then 10 are still known to exist. It is fantastic to look at, and the small 1,2 litre straight six engine produces a sound which you only expect from a big Bentley 4,5 litre.... One of the most impressive small cars we ever had, and a guaranteed entry ticket for the most prestigious events in the world. 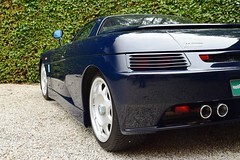 Alfa Romeo SZ 'Il Mostro' in brand new showroom condition. 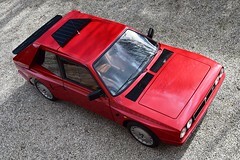 For the real collector : a Zagato built Alfa with only 2.400 km on the clocks. 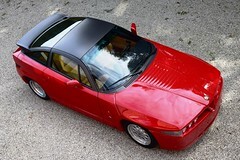 How was the Alfa Romeo SZ when it was introduced in 1990 ? Well, probably exactly like the example we have just in now. This SZ has been in an Alfa Romeo dealership showroom in Rome, and is still exactly as it left the Zagato works in 1990. With only 2.400 km on the clocks, it is a virtually new car. It comes with all books, tools, car cover, warranty cards and some very limited pubilications about the SZ cars. This is a collectors dreamcar ! Rare and dropdead gorgeous : De Tomaso Guarà. One of only 39 examples ever made. This example is the fourth Guarà constructed, and still in immaculate condition. The Guarà was the very last De Tomaso which founder Alejandro De Tomaso put on the market. Equipped with a reliable BMW 4,0 litre V8 engine, this racecar for the road was full of exotic materials : a body shell constructed with Kevlar and fiberglass, fitted on a backbone chassis with true formula one style suspension. The Guarà is today a real exotic which fits the most exclusive car collections, and we are very proud to have one in our inventory. An iconic name for a fantastic car. This is a low mileage Porsche 911 Speedster from the first series. 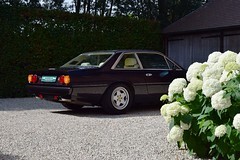 A rather rare car with good looking wide body, finished in a gorgeous colour combination of Grand Prix Weiss with full Weinrot leather interior. A proper eighties poster car, and with only 2103 examples made an interesting car for any collection. 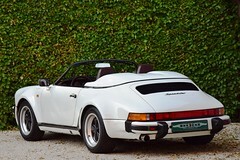 For sale : Porsche 911 Speedster WTL (1989). One of the highlights of Paris-Dakar history. 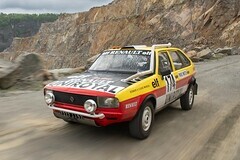 The famous Renault 20 Turbo 4x4 of Bernard and Claude Marreau. A unique car, with unique history from a unique event. I remember this car from my youth, when Paris-Dakar was all about heroes : on the French television was a daily report of the gruelling desert rally, and this car really stood out between the Mercedes 280GE's, Lada Niva's and many Range Rovers. On YouTube there are still some movies about this car, performing very well in the African deserts. Now in our showroom after many years in a private collection. Do you want to participate in historic racing on the highest level ? 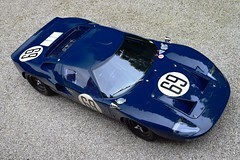 Probably the most spectacular racecar we ever had in our inventory : a beautifully constructed Ford GT40, prepared for historic racing in the FIA class 1962-1965. A potential winner with a very potent Ford 289ci race engine producing 445 bhp ! FIA HTP valid until 2028, and ready for victory in any Masters Series race and Spa 6 hours. 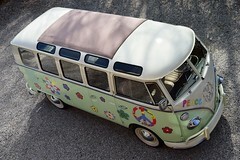 Just arrived in the inventory : a fantastic 23-window VW Microbus. A very unusual car has just arrived : a beautifully restored VW Microbus from 1965, nicely decorated with flowers just as in the swinging sixties. A perfect trip to Memory Lane (or was it Woodstock ?) and ready to be enjoyed. For the third time, Albion Motorcars will be present on the most important classic car show in the world. With great pleasure, we will be present at the 2018 edition of Techno Classica in Essen, from Wednesday 21/03/2018 until Sunday 25/03/2018. Our stand with nr. 6.0-406 is located in Hall 6, which is the main hall of the show. We will have 6 exceptional cars at this fantastic show : Aston Martin DB4 Series III, AC Cobra 427, Porsche 356 Carrera GS/GT, a very rare Zündapp Janus, an incredibly original and unrestored Morgan Super Sports from 1934, and last but not least the king of the Group B rally specials : Lancia Delta S4 Stradale. Looking forward to see you all in Essen ! We invite you to visit our stand at Interclassics Maastricht 2018. 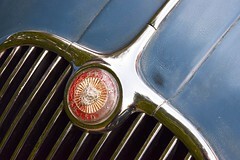 A wonderful range of rather special classic cars will be on display. With great pleasure we invite you on our stand at Interclassics Maastricht from the 11th until the 14th of January 2018. We will show a tasteful selection of exquisite classic cars, including an extremely rare Zündapp Janus, the unique Renault R20 Turbo 4x4 Paris-Dakar, an elegant Arnolt MG Coupé and a dropdead gorgeous Citroën SM. 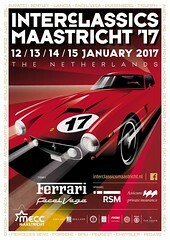 Please visit our stand (N936 - Noordhal) to discover these unique classic cars. 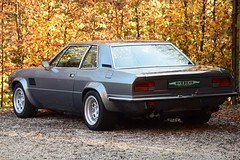 A gorgeous De Tomaso Longchamp GTS now in our inventory. This rare De Tomaso Longchamp GTS is just arrived. A matching nrs car from the 1st series, converted by the De Tomaso factory in 1990 to GTS specification. Headrests signed by Alessandro De Tomaso. This is a unique opportunity to obtain one of the best examples of this iconic De Tomaso. And it drives as good as it looks ! More information and pictures in the "For Sale" section of the website. An invitation to visit our stand at Interclassics Brussels 2017. We will have a nice selection of interesting cars on display. As every year, Albion Motorcars will be present at Interclassics Brussels from Friday the 17th of November 2017 until Sunday the 19th November. We will have 8 fantastic classic cars on display, and our stand is on the usual position in Hall 1 (Stand No. 1.51) just beside the main entrance. We are looking forward to meet you there for a drink and a chat ! 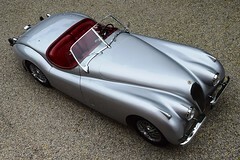 An unrestored Jaguar XK150 DHC, ready for use as it is. This is how we prefer our classic cars : unrestored with lots of patina, but utterly reliable and ready to go anywhere. I have used this incredible Jaguar XK150 for the past year for many events and trips, and I have enjoyed every minute in this great motorcar. It attracts attention anywhere due to its untouched and patinated looks, and is a real pleasure on the road as it offers a driving sensation which only an unrestored and original can provide. Something for the real collector/connoisseur ! with four seats and many comfort items which are unusuable for their age. No wonder, as these motorcars were the most expensive cars money could buy at the time. Please have a look in the "For sale" section of the website for more pictures and information. Another great example of the gorgeous Jaguar XK has just arrived. Beautiful XK120 OTS in a magnificent colour combination. Just arrived : one of the best Ferrari 412 in the world. 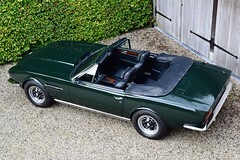 An elegant V12-engined grand tourer in immaculate condition. Searching for your entry ticket for the Mille Miglia 2018 ? Look no further, this is the one. Fantastic Studebaker Golden Hawk. Just back from the 2017 MM, and ready some more. 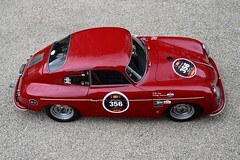 This is not your typical car to participate in the Mille Miglia, but it is certainly on the eligibility list. 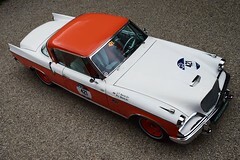 Only one Studebaker Golden Hawk has participated in the period Mille Miglia, and not many have been entered in the later editions. So it is the perfect choice if you want to be different, which also means there is a much bigger chance to be accepted ! And that is exactly what happened with this magnificent example : it has done the 2017 edition, and is almost certain to be accepted for the next editions as well. It is a first class eyecatcher, and a most reliable and comfortable machine to cover the 1000 miles from Brescia to Brescia. 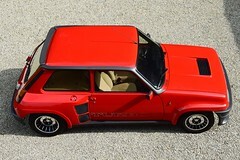 Another fantastic R5 Turbo 2 available. The french supermini from the eighties on steroids. The holy grail for the Porsche collector. This is a collectors car which can be used in almost every event : the most prestigious historic races, and the most exclusive concours d'elegance. This Porsche 356 Carrera GS/GT ticks all the right boxes. On top of that, it is in fantastic condition and very well documented. Definitely one of the most special cars we ever had in the inventory. More information and pictures in the "for sale" section of the website. This is the car from Dino Compendium ! 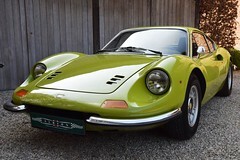 A dropdead gorgeous Ferrari Dino 246 GT in Verde Germoglio. With great pride we offer this fantastic Ferrari Dino 246 GT for sale. This is the ex-Matthias Bartz car, which he used as sample in the famous Dino Compendium book (aka The Dino Bible). It must be one of the best Dino's in the world, with full matching nrs and finished in its original and rare colour Verde Germoglio. This car also has the Ferrari Classiche certification, and looks absolutely fabulous ! For sale : Ferrari Dino 246 GT. Range Rover Vogue EFI with only 60.040 km and in immaculate condition. Probably one of the best available. The classic Range Rover is the daddy of all SUV's : a great mix of style and ability. A car which you could find on the driveway of farmers and hunters, but also adored by kings, rockstars and landlords. No wonder, as there was no other motorcar available at the time which was both powerful and comfortable, and could still bring you anywhere. 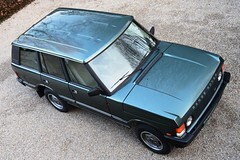 This example is in exceptional and original condition, and looks and feels as it just left the Solihull plant. A very rare find. 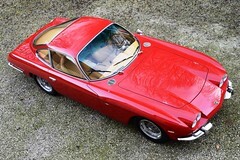 Very rare and dropdead gorgeous : Lamborghini 400 GT Interim. One of only 23 examples, and restored to perfection by Carrozzeria Touring Superleggera. This is probably one of the most beautiful sportscars ever made. The first production car made by Lamborghini, much rarer then a period Ferrari and powered by a strong 4 litre V12 engine which was later used in the Miura, Espada, Jarama, Islero and Countach. Cars don't come often with a better pedigree ! A blue chip investment, great to look at and even greater to drive it. More information and pictures in the "for sale" section on the link below. We invite you to visit our stand at Interclassics Maastricht 2017. A fantastic range of classic sportscars will be on display. It is a great pleasure to invite you on our stand at Interclassics Maastricht from the 12th until 15th of January 2017. We will show a tasteful selection of exquisite classic cars, including an extremely rare Lamborghini 400 GT Interim. Only 26 examples were made of this italian thoroughbred, and the car we offer for sale is probably one of the best. 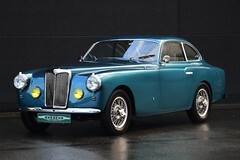 It has matching nrs and colours, and is restored by its original manufacturerer : Touring Superleggera of Milan. Please visit our stand (N936 - Noordhal) to discover this unique and beautiful classic car. A very spectacular AC Cobra 427 is just arrived. The last Frimley built AC, in as new and immaculate condition. The AC Cobra 427 is one of the fastest cars of the sixties, and it still is a devastating sportscar which needs a skilled driver. This lightweight car with loads of power and torque offers a most entertaining driving experience which will impress most supercar owners. It looks gorgeous, certainly in red, and sounds like a thunderstorm. This aluminium bodied beauty is just arrived and is ready for a new owner (but not a car for the faint hearted...). Completely restored and matching nrs. 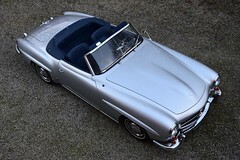 This very stylish roadster with the three-pointed star on the bonnet is just arrived. Completely nut-and-bolt restored in Germany, and of course with matching nrs. A great tourer and a sound investment, certainly in this pristine condition.